Comtrust director Dawne Williams presenta a cheque for BDS$50,000 to director general of the Barbados Red Cross Society Edmond Bradshaw. Haiti, The Bahamas, the Turks and Caicos Islands and Jamaica have received more than US$150,000 for disaster relief FirstCaribbean International bank announced in a release. This follows the adverse effects of several severe weather systems in recent months and the significant recovery efforts needed to return these countries to normalcy. Jamaica will be allocating the funds to assist with repairs to schools, senior citizen’s and children’s homes and affected farming communities. Funds for Turks and Caicos Islands will be administered by the National Disaster Relief Fund and the Red Cross, while the National Emergency Management Agency (NEMA) will oversee funds to assist with the rebuilding of Morton Salt located on Great Inagua. The bank through its charity, the FirstCaribbean International Comtrust Foundation Limited recently teamed up with the Barbados Red Cross Society to assist with the Haiti Hurricane Appeal. The Bank donated US$25,000 to Haiti to assist with general recovery efforts. During a special presentation to the Red Cross, Comtrust director, Dawne Williams, described the situation in Haiti as heartbreaking. 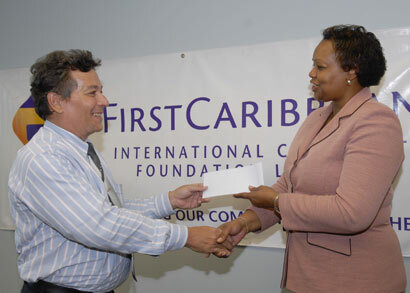 “This donation is therefore from the hearts of all of us at FirstCaribbean,” said Willaims, also observed that in its six years of operation, FirstCaribbean has made disaster relief one of the main priorities of its social responsibility agenda. The first shipment of basic materials such as tarpaulin had already arrived in Haiti. Edmond Bradshaw, director general of the local chapter of the Red Cross, explained that cash donations were preferred in light of the difficulty of shipping items from port to port which, in some cases did not reach the destination intended. Bradshaw urged donor agencies to remember that Cuba was also among countries needing assistance. The Comtrust administers the bank’s Corporate Social Responsibility and comprises a seven member board of trustees which is currently chaired by managing director for The Bahamas, Sharon Brown.